In a rambling, 80-minute speech before a capacity crowd of more than 10,000 at the Van Andel Arena in downtown Grand Rapids, the president voiced his satisfaction about the end of the two-year investigation into Russian election interference. He again falsely claimed that he was totally vindicated and exonerated. Trump’s son, Don Jr., introduced the president and shared a similar sentiment. The first-term Republican president also ran through a laundry list of economic achievements and swore he would secure $300 million for the Great Lakes Restoration Fund, which he proposed cutting by 90 percent earlier this month in his budget proposal. This was Trump’s second budget policy reversal of the day. There had been considerable blowback about his education budget axing funding for the Special Olympics — something West Michigan native and U.S. Education Secretary Betsy DeVos twice defended in Capitol Hill hearings. Just before departing for Grand Rapids, the president announced he would fund the organization, as the Advance reported. U.S. Rep. Bill Huizenga (R-Zeeland) was one of three members of Michigan’s Republican congressional delegation in attendance on Thursday, along with U.S. Reps. John Moolenaar (R-Midland) and Jack Bergman (R-Watersmeet). Huizenga, who’s a co-chair of the Great Lakes Water Task Force, told the Advance following Trump’s remarks that he has “no doubt” that a final budget will have full funding for the Great Lakes. 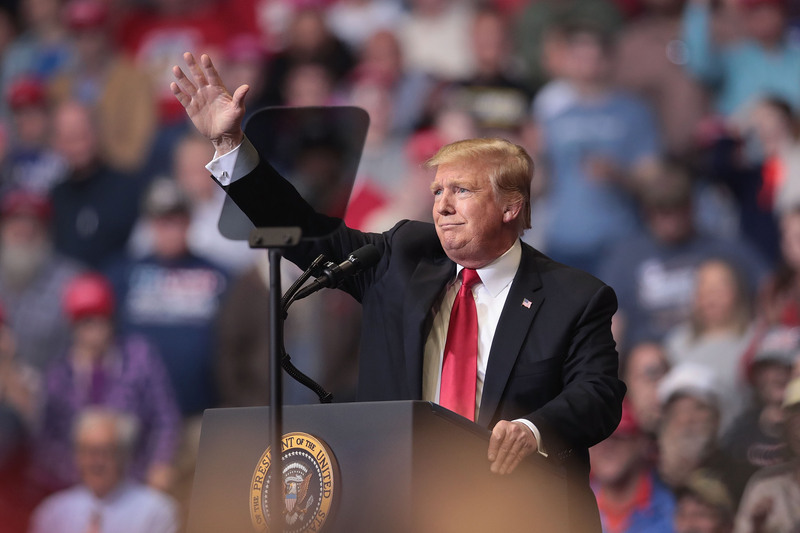 Thursday’s campaign rally in Grand Rapids marked the official start of Trump’s 2020 presidential re-election campaign. He was greeted at the Gerald R. Ford Airport by the three congressmen, as well as state Rep. Matt Hall (R-Emmett Twp.) and former Attorney General Bill Schuette, who lost his 2018 bid for governor. Trump didn’t mention the woman who beat Schuette by name, now-Gov. Gretchen Whitmer, simply calling her “Michigan’s new Democrat governor,” which resulted in “boos” from the crowd. However, at a state dinner for governors last month, Trump had Whitmer sit next to him and they talked about the Great Lakes, trade and the auto industry. Michigan is expected to be a major battleground state. The Cook Political Report lists the Mitten State as one of just five battleground states, along with Wisconsin, Arizona, Pennsylvania and Florida. He also held his last rally of the 2016 campaign in the very early hours of election day. That wasn’t lost on either Trump or Michigan GOP Chair Laura Cox, who noted Trump’s final 2016 stop in the West Michigan city. “Grand Rapids, you are President Trump’s lucky charm,” Cox said. With Michigan’s swing-state status and the narrow 10,704-vote margin by which Trump carried the state in 2016 over former Secretary of State Hillary Clinton, Democratic presidential candidates are already flocking to the state as well. Both former U.S. Rep. Beto O’Rourke (D-Texas) and U.S. Sen. Kirsten Gillibrand (D-N.Y.) made the rounds in Southeast Michigan last week. U.S. Sen. Sherrod Brown (D-Ohio) sent out a fundraising email on Thursday reminding voters of how critical Michigan is for Democrats. Michigan Democrats, not surprisingly, slammed Trump’s appearance in Michigan. A protest before Trump’s rally was headlined by retired Army Maj. Richard Ojeda, a former Dem presidential hopeful, as the Advance first reported on Wednesday. The event also included “Baby Trump” and “Trump Rat” balloons. Lavora Barnes, chair of the Michigan Democratic Party, said in a statement that Trump is ignoring the issues that Michigan voters care about. “If he listened for once, he would hear the growing rumblings of an entire state that is sick of the attacks, tirades, excuses, and embarrassment that increases every day his corrupt administration occupies the White House,” Barnes said. He also issued his standard attacks on Democrats. What Trump said about the Great Lakes being deep was at least as ignorant as when Mitt Romney said seven years ago about the trees. But at least this is Mitt’s home state.